Transmission electron micrograph of stacked annulate lamellae from the oocyte of the sea urchin Arbacia. Annulate lamellae consist of sheets of membrane containing closely packed structures resembling nuclear pores. 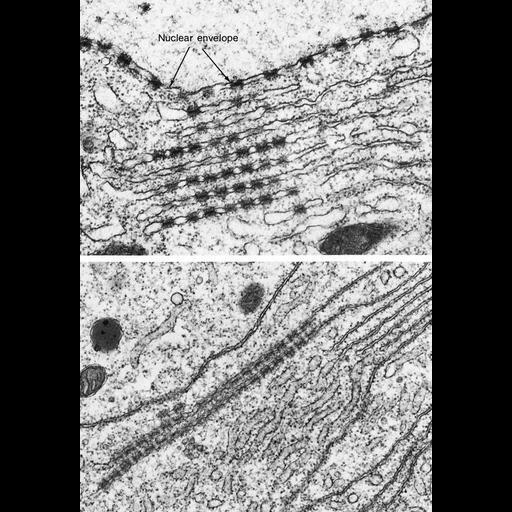 Micrographs courtesy of Susumu Ito, Figures 161 (upper) and 162 (lower) from Chapter 4 (Nucleus) of 'The Cell, 2nd Ed.' by Don W. Fawcett M.D. A PDF copy of the accompanying chapter is available on the ASCB's BioEDUCATE website.